Ahh the holidays…. Egg nog, cold weather and… SHOPPING! Seems like as good a time as ever to tell you about the things that I like to buy. I thought for the next few days I would highlight some of the things that I really like, and maybe you can discover some resources you didn’t know about. Most of the products I will mention are things that I have purchased myself, so I am fully comfortable recommending them to you. If nothing else, you can send your relatives/loved ones here for gift ideas. It is slightly less obvious than just flat out posting on your blog the things that you want them to buy (though I fully support that idea). Getting a magazine subscription for your crafty friend or loved one is a way to keep them inspired all year long. They are also a good solution for last-minute shoppers since you can give gift subscriptions online. Craft: Magazine ($34.95 – 4 issues/year) Innovative craft ideas with complete instructions. Everything from knitting patterns, to sewing electronics into your wardrobe. At first glance this publication looks a little pricey, the final object is very nice. Like its sister (brother?) publication, Make: Magazine, the format it more like a softcover book and you can imagine referring back to these for years to come. Adorn More similar to a fashion mag (in a good way) than any other crafty publication that I can think of, Adorn epitomizes classy yet accessible craftiness. i like it! 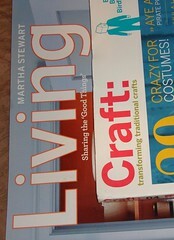 Martha Stewart Living ($24 – 12 issues) I am not a self-proclaimed Martha Fan. I mean, I like her stuff enough, and I like that she seems like she has overly high standards and is kinda mean… And she is like the craftiest ex-con ever… But I wouldn’t call myself a fan. I don’t get this magazine, but every time I read one, I found something in it I really like. I guess that makes me a closeted Martha fan. I am always impressed in the number of crafty projects in Readymade that I feel I could actually put to use in my apartment. And they always have an article on some craftsperson that I am completely intrigued by. Plus, they are practically my neighbors so it is like supporting the locals when i pick up a copy. Independently published pamphlet-like magazines are also a great read! 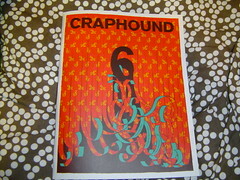 Craphound ($10) People. just go buy one of these now – I’ll wait. This Zine is a big fat pack ‘o fun. I think it would be an understatement to call it clip-art so instead I will say that it is a collection of illustrations and images on various themes. Issue #6 is the most recent and is titled “Deaths, Telephones and Scissors”. These are a pure joy to look at and use as a crafting reference. If you are the least bit intrigued just go buy one NOW – The back issues sell on ebay for a mint. Croq Zine ($15 – 4 issues) Still crafting strong and headed for their 11th issue, this zine has never let me down. There are always a couple of article or projects that I enjoy reading about. These guys and gals have their act together and you can purchase a pack of back issues, as well as a 1 year subscription. Church of Craft Zine ($3- 5 back issues)– Sister Diane of the Portland Church of Craft has made available back issues of zine she produced. Take a look around her etsy shop, because she has several other crafty zine offerings. That’s all the magazine ideas I have. But i have many more crafty guide ideas so stay tuned for a few more posts!